Tired of forgetting what services you’ve recently had done to your car? 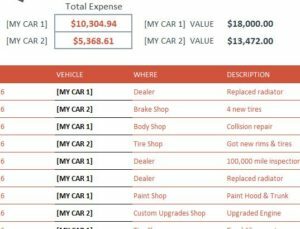 The free Vehicle Expense Tracker is a template that can track the various expenses of your car. You’ll always know what your car needs and where you can for excellent service. This free template document stores a running list of every expense that might be associated with your car in a way that can easily be read. If you’re looking to keep your car in tip-top shape and save money at the same time, then follow the instructions given below for more details. To download the free template to your computer, just click the link at the bottom of this page to get started. The next step will be to take a look at the structure of the template itself. You have a running total for all the expenses of the car. You can enter these items in the table at the bottom of the first tab. Start in the “Data List” tab to build your initial list of information. These are simple categories that you can use in the main table to make entering items faster. You can even add to the list by dragging the arrow in the last cell down. Going back to the main table of the document, you would simply enter the date, the car you’re tracking (we recommend naming them), the location you took to get the car serviced, the service description, and finally the price. The template will display the cars you’re tracking at the very top of the page, along with the complete total you’ve spent on that car. This template makes tracking expenses simple and easy. You don’t have to waste time or money on things your car doesn’t need, track your car expenses today!